Did Uber make the right move when it exited the world’s most populous markets? Financially, the answer seems to be yes. The deals have spared Uber from losing billions of dollars and so far they have been sound investments, according to the ride-hailing company’s IPO filing. Uber has already seen some gains from its exit deals with local players, including China’s Didi Chuxing and Russia’s Yandex. Those minority stakes, including 15% in Didi Chuxing, 23% of Singapore-based Grab and 38% of Yandex taxi, collectively contributed $12.5 billion to Uber’s valuation, which could reportedly be worth $100 billion. But the unusual arrangements also leave Uber competing with its own investments as regional leaders in the industry expand and look for new opportunities to grow. While Lyft (LYFT), which has experienced a free fall in its first month in the public market, operates only in the U.S. and Canada, Uber is a global transportation empire operating in over 63 countries. The international market is crucial to the company’s growth— markets outside the U.S. account for approximately 74% of all trips booked on its platform in the last quarter of 2018. As Uber is getting a bigger share of the global ride-hailing business, which Grand View Research projects to be worth $11.94 billion by 2025, it will inevitably be battling for market share with companies that it owns minority stakes in. The San Francisco-based startup expanded abroad in 2011 at a stunning growth rate. Uber launched in a new city each day by the end of 2014. The expansion sent Uber’s valuation ballooning, but not all of its overseas endeavors have panned out very well. Uber competes against Didi around the world, and we have it mapped out. After years of cash burn in China, Russia and Southeast Asia, Uber exited those markets in exchange for minority stakes in local players there. The deals prohibited Uber from running its own service in those markets for a few years, but the battle continues elsewhere as Didi and Yandex grow in markets where Uber is present. However, Uber’s deal with Didi is still pending the approval from the Chinese government after more than two years. Now, Uber and Didi are in a face-off in Mexico, Brazil, and Australia. And in some European countries Uber is taking on Yandex. “These companies have expanded their offerings, and we expect them to continue to expand their offerings in the future, to compete with us in various markets throughout the world,” Uber’s IPO prospectus said. Didi, for example, is competing with Uber not just by itself, but also through a proxy war. 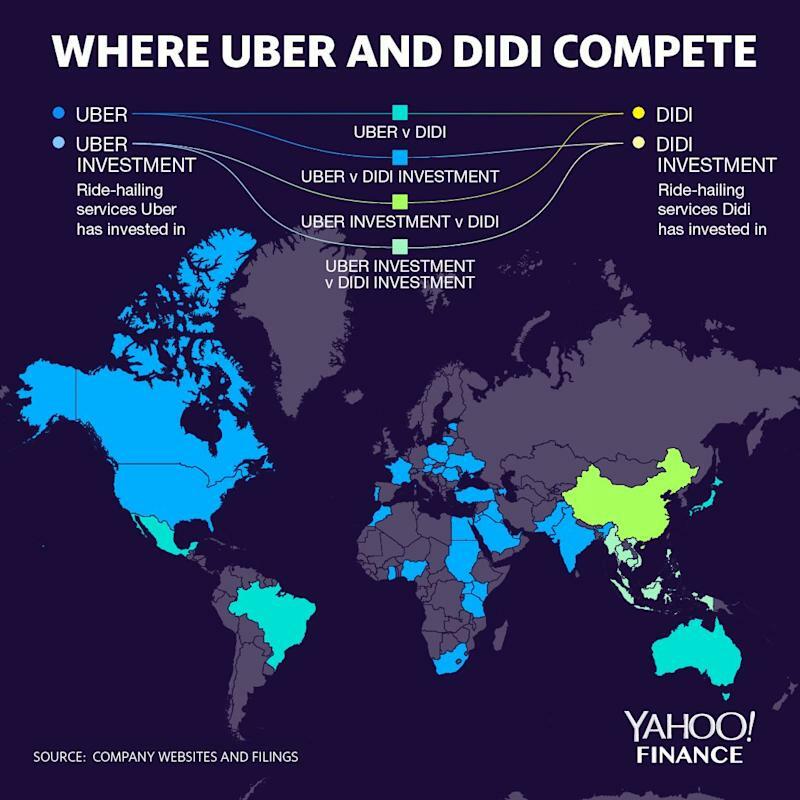 Didi has backed Uber’s rivals in major markets, from India’s Ola, Europe’s Taxify, Brazil’s 99 and a $100 million investment in Lyft at Uber’s home turf. In 2017, Didi also invested in Careem, the Dubai-based ride-hailing service which was acquired by Uber at $3.1 billion in March. The structure also highlights the vital role of Softbank, the investor that has spun a ride-hailing web across the world. Softbank is behind Didi, Uber, and Grab, and is believed to have helped Uber negotiate its exit deals.